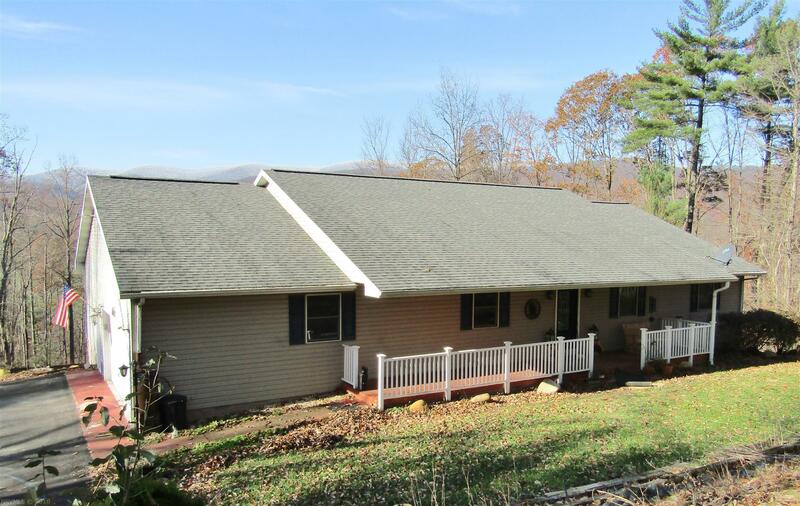 Amazing mountain views & view of the New River from this secluded property in Giles Co. Custom built Ranch with over 4,000 sq ft of finished living space! See attached special feature sheet. Dream custom Kitchen w/stainless appliances (new double oven & microwave), island, soft close drawers & spice rack. Beautiful hickory hardwood floors in Living RM, Dining & Kitchen. Recessed lighting. Central Vac system. Two heat pumps. Greenhouse on property with a variety of fruit trees & bushes. Enjoy the amazing view from the back deck & patio. Relax to peace & quiet on the covered front porch. At the back of property you will find a 12 x 12 building w/deck with a breathtaking view of the New River. Single under garage is perfect for workshop or storage. Additional 6.3 acres available for purchase. Directions: Rt 460w. Take 1st Pearisburg Exit. Turn L Onto Bus460/Wenonah Ave. Turn R Onto French St. Turn R Onto Curve Rd. Turn L On Evergreen Rd Go To End. Bear R Onto Drive. See Signs.